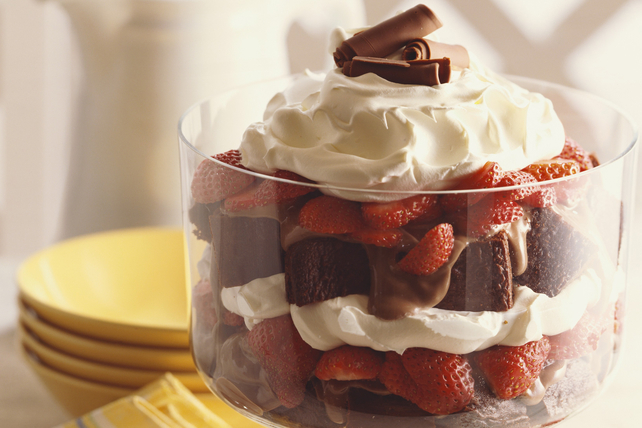 Layer chocolate brownie bits with pudding, fresh strawberries and whipped topping for a classic dessert. Beat chocolate pudding mix and 1-1/2 cups milk in medium bowl with whisk 2 min. Stir in 1-1/2 cups Cool Whip. Repeat in separate bowl with vanilla pudding mix, remaining milk and remaining Cool Whip. Place half the brownie pieces in 4-L bowl; cover with layers of half each of the chocolate pudding mixture, strawberries and vanilla pudding mixture. Repeat all layers. Garnish with chocolate curls made from your favourite Baker's Chocolate before serving. Substitute 1 pkg. (360 g) marble pound cake, cubed, for the brownie pieces.